Crude #4 is out July 18. 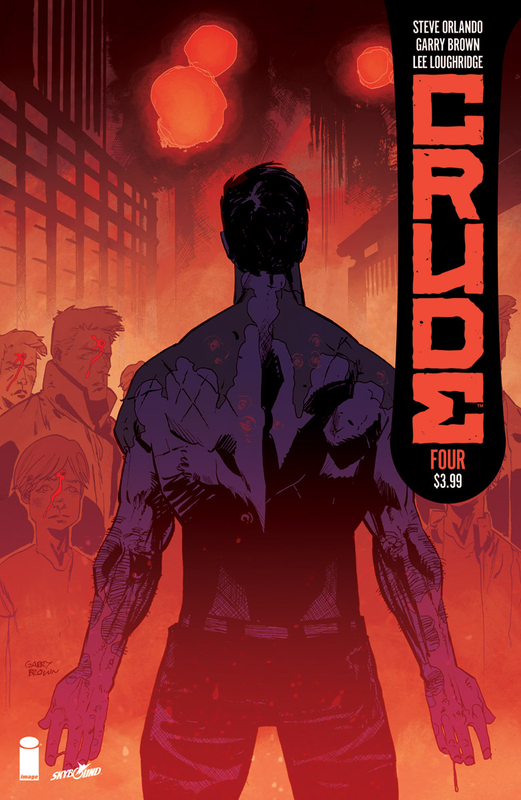 By Zack Quaintance — Crude #4 is yet another intense and emotional installment for one of the smartest series in indie comics. This book has a pair of clearly established plot lines—a father-son revenge story, and a meditation on late-model capitalism curtailing the humanity of individuals—and in this issue they begin to thoroughly intertwine in a way that really pushes the story forward. Crude #4 opens exactly where the preceding issue left off, with protagonist Piotr Petrovich demanding information about his murdered son from a mob of attackers, all of whom he subsequently dispatches while incurring no greater damage than a cut on his arm. No greater physical damage, anyway. The larger stakes of the battle (as well as this book) involve what our hero learns about his son. Being able to win fights but wanting instead to know more of his lost son is a value structure established quite well by Crude’s first three issues. Where #4 finds new ground is in its exploration of workers rights, corporations, industrial cartels, and the way individuals are controlled and debased by corrupt systems, no matter how hard they work. It also starts to explore the generational gap that has taken hold in society's across the world: the father as a good trusting soldier, the son as someone striving for change. This may be a reductive, but Crude is sneakily timely as hell. In one particularly effective scene, a shady besuited executive rages that a single man is causing him so many problems, a man who is effectively acting outside established structures. It’s a telling metaphor, one Orlando and Brown have previously hinted at but kept in the background, wisely devoting earlier issues to vesting the audience in the more poignant father-son story. One of the things I liked most about Crude #4, though, was the growth for the hero (or the promise of growth soon). It’s the best sort of character development: painful yet exactly what he wanted. Piotr has essentially been broken down of his own volition, continuing to learn that he didn’t know his son at all. Now begins the fascinating work of watching how he responds. I’ve made this (likely simplistic) comparison before, but the emotional complexity of this comic is a bit like a Russian novel. At the same time, Orlando and Brown are clearly seasoned comics creators, because the usual qualities of great visual storytelling in chapter format are very much present: action, cliffhangers, callbacks to earlier issues. For me, it's this mix of fundamentals and meaning that make Crude so compelling. For more about Crude, read our previous reviews of Crude #2 and Crude #3.